You've been outbid by w****2! by YOU! You've been outbid by p****9! by YOU! You've been outbid by n****a! by YOU! (4) Budweiser Clydesdales holiday steins, 50th Anniversary, 1991, A Series and one other. You've been outbid by t****y! by YOU! Pabst Blue Ribbon limited edition stein No9696. 4 pieces. You've been outbid by l****k! by YOU! You've been outbid by m****.! by YOU! 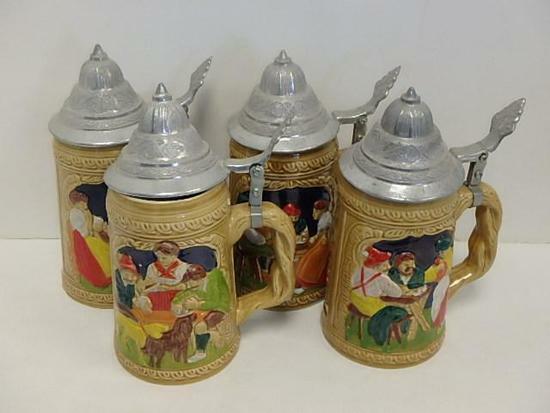 (4) Budweiser steins, 2 with metal lids, 1986 B series and B Series No40733 and E Series No14953. Hometown Holiday, Stroh's Bavaria Collection stein, and James A Meger White Tail Deer Stein, made in Germany. 4 plates, 2 steins, 6 pieces total. (1) Budweiser shot glass/stein. 5 pieces.